Wine, dine and yoga while exploring the Piedmont Region of Northern Italy. We’ll explore the local history, culture and sights, immerse ourselves in the beauty of the region. We offer an intimate, tailor-made tour of Piedmont out of our home base in Calamandrana, where you will enjoy the scenic country roads, visit local wineries and explore local cuisine. You’ll have a chance to visit ancient hill-top villages and historic towns, and learn about the special gems and secrets the region has to offer from, we are local residents and live here year-round (fluent in both Italian and English). Just bring your open mind and sense of adventure – and we'll take care of the rest! Accommodation: 8 days and 7 nights in Calamandrana, Piedmont, Italy. All Meals: *Breakfast, lunch & dinner, including wine; each day we will have a chance to taste Piedmontese cuisine at rustic farmhouses and fine restaurants, including Michelin starred. Pearl of the Region : Visit to a truffle house or a truffle hunt! Cooking class (optional): If all participants would like it, we’ll have a chance to learn how to cook local specialties and sample them for dinner at a local agriturismo. To be decided when everyone has signed up. Shopping: Free-time for shopping and relaxation; Borsalino in Asti, all famous brands in Torino. If your visit is in July or August you will also encounter the sales season in Italy! Yoga sessions : Allow yourself the space and time to fully be present. Take this journey to Italy and escape the busy day-to-day routines we so often get held back by. The most powerful component of yoga is the connection of mind and body. The ability to control the breath to root you in the here and now. Moving through the week you will spend time each day in a variety of flowing movement and seated meditations connecting to the present moment. This retreat offers the unique exploration of presence as we take our practice to a few of our excursions to wineries and terraces. Not only will we have the opportunity to build our community together, we will be able to extend our practice of karma to a beautiful group of Downs people. On the days we practice on site our yoga sessions will be faster flowing. Each day we’ll aim to have a 30 minute quite time to reflect /journal. Transportation: Private transport from Turin Caselle or Milano Malpensa Airport; and for all of your tours included in your 8 day stay. Guides and Hosts: We live locally in Calamandrana and are native English and Italian speakers. This tour costs 3400 Euros per person, not including airfare. While most of you may have heard of the famous Barolo or the Barbaresco and the delightful Moscato d’Asti, have you heard of these Italians (and in particular Piedmontese) such as Arneis, Barbera, Bracchetto, Nizza, Pelaverga, Ruche’, Timorasso, just to name a few? During this tour you will visit wineries and have wine tastings not to mention wine pairing dinners with these and other amazing Italians. 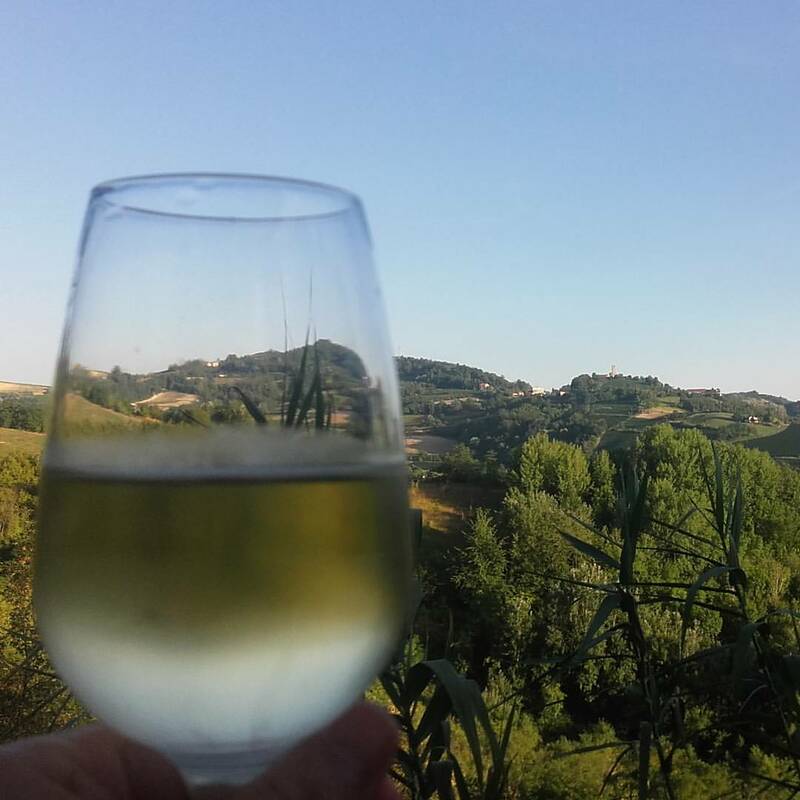 Join us in the Piedmont region of Northern Italy where we’ll explore the local history, culture and sights, immerse ourselves in the beauty of the region, and the wines! We offer an intimate, tailor-made tour of Piedmont out of our home base in Calamandrana, where you will enjoy the scenic country roads, visit local wineries and explore local cuisine. You’ll have a chance to visit ancient hill-top villages and historic towns, and learn about the special gems and secrets the region has to offer from our hosts, who are local residents and live here year-round (fluent in both Italian and English). Just bring your open mind and sense of adventure – we take care of the rest! Accommodation:8 days and 7 nights at La Corte in Calamandrana, Piedmont, Italy. All Meals: Breakfast, lunch & dinner, including wine; each day we will have a chance to taste Piedmontese cuisine and wines at rustic farmhouses and fine restaurants, including a Michelin starred one. Wine pairing dinners: Each evening you’ll enjoy special tasting menus paired with excellent Piedmontese wines. We’ll also have 3 evenings with a guest sommelier form AIS Piemonte guiding us while we enjoy and learn about the wines of the evening. Special Sparkling Wine tasting:Visits to 2 UNESCO World Heritage Site listed underground wine cellars of Canelli, of course followed by a taste of their fine sparkling wines. Pearl of the Region :Visit to a truffle house or a truffle hunt! Transportation: Private transport from Turin Caselle or Milano Malpensa Airport*; and for all of your tours included in your 8 day stay. Cost: 3545 Euros per person not including airfare. *we require that all guests fly in/out of the same airport.